I ate this Salmon with Avocado salad as an appetizer on one of the sushi restaurants in town. I really fell in love with the sweet, tangy taste of the salmon melts in your mouth along with the buttery avocado. Unfortunately, for a mini-ants-bowl of this salad was pretty pricey at the restaurant. 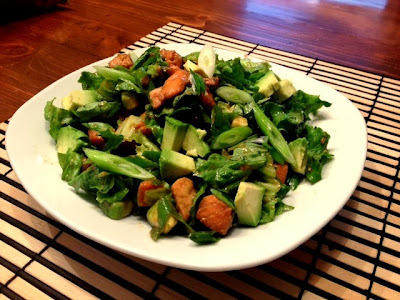 I was determined to find the recipe and make the salad myself so I can enjoy it as often as I want to. I got the recipe from this site . I am not sure if its the exact recipe that the restaurant uses, but it taste almost identically similar. 1. Mix Japanese soy sauce, mirin and brown sugar in a container then marinate the fish in the mixture for few minutes. 2. Meanwhile, prepare your cucumber, lettuce and spring onion. To prevent oxidation, cut the avocado before you serve. 3. Heat a non-stick frying, pick up the fish from the mixture and cook it on the pan (don't use oil) for 2-3 minutes. Fold occassionally. 4. When your fish start to change color, add the marinate mix into the pan and let it bubble away for a minute or two. Once the fish is cooked enough to your liking (some people like their salmon a bit pinkish in the middle), pick up the fish and set aside on a plate. 5. Continue cooking the marinate sauce and add the rice vinegar, mix the sauce with spatula often so it doesn't burnt on the bottom. Once the sauce thickens, turn of the stove and set aside. 6. For the waffu dressing; mix mayonnaise with sesame oil then pour in the almost sticky thick sauce from the fish. Mix thoroughly. 7. Put the cucumber, lettuce, spring onion, avocado and pour the waffu dressing sauce over the salad and toss gently. 8. Plate the salad on the serving plate and put the fish on top. Your sweet salmon salad is ready to serve!